j Open the Modules tab in the Content panel. k Open the Rows tab in the Content panel. 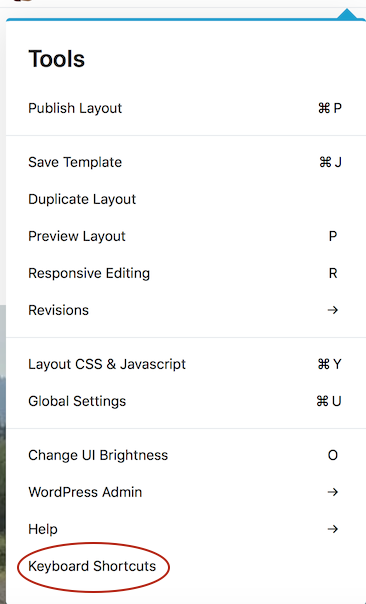 l (Lowercase L) Open the Templates tab in the Content panel. ; Open the Saved tab in the Content panel. ⌘+j (Mac Open the Save template window. p Toggle in or out of Preview mode. ⌘+u (Mac) Open Global Settings in the Tools menu. o Toggle between dark and light UI modes in the Beaver Builder editing bar. ⌘+i (Mac) Display module search. Forces a Save of the current settings. Equivalent to clicking Save in a Settings panel. Note that edits are automatically saved when soon you click on another item to edit it. ⌘+p (Mac) Publish changes without leaving the Beaver Builder editor. Esc (Escape key) Close the active window. This shortcut is disabled if there is any risk of data loss, such as Tools settings windows.